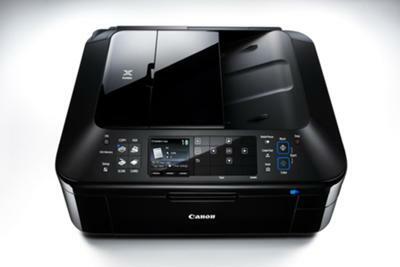 Home users, home offices and businesses will welcome the addition of new multifunctional printing devices in the market, as presented in this Canon Pixma Smart Office Multifunctional Printers review. Canon Pixma Smart Office series deliver high speeds, offer flexible media handling and versatility with their wireless connectivity and direct printing abilities. They boast of long-lasting photo prints that are designed to last for 300 years and sharp black text, even as it is printed over an image. They come with a smart panel that gives ease of use in printing, copying, scanning and faxing, making it meet the needs of different users. Canon Pixma MX886 comes with a 3” LCD display that gives a clear view of printer menu and lets you preview images before printing to enable excellent prints. It allows simple operation for photo printing, copying, scanning and faxing. It comes with a new panel with dual functions that lets you switch between printer functions. Its keypads pertain to different functions: the number keypad refers to the fax mode, the direction keypad is meant for copying while a simple key pad is for multi modes. This gives you better control over the printer’s functions. It measures 19.33” W x 17.64” D x 8.58” H and weighs 25.8 lbs. It prints with a speed of 12.5 images per minute for mono and 9.3 images per minute for color. It prints a 4” x 6” borderless photo as fast as 20 seconds. It comes with 5 individual ink tanks that allow easy ink replacement. It incorporates the ChromaLife 100+ technology that gives long lasting pictures that last through several generations. It, also, includes the Hybrid system that makes use of both pigment and color dye inks that produce sharper black text even as it is printed on top of an image. The MX886 enables you to print directly from an iPad, iPhone, iPod and Android devices. In addition to this, you can print, straight, from other sources like memory cards, Pictbridge enabled digital cameras and USB flash drives. It scans with a resolution of 2400 x 4800 dpi. It comes with an auto scan mode to let you scan, straight, to flash drives. It has a new reserve copy feature that allows you to scan while waiting for your copied document or photo. Its auto document feeder allows copying at a speed of 6.7 images per minute. It is capable of 99 multi copies. It comes with Dual Colour Gamut Processing Technology that produces copies of second generation documents and photos, with precision. It lets you transmit documents or photos through fax, with high speed. It has a 35 sheet auto document feeder that offers convenience in transmission. It enables storage of 250 faxes in memory and has security features of re-entry of fax number; checking of RX fax info; rejection of caller and rejection of fax transmitted. It supports an assortment of media forms such as plain paper, photo paper, matte paper, glossy paper, photo stickers, t-shirt transfers and envelopes. It can handle different sizes of A4, A5, B5, letter size and legal size. It has auto duplex printing capacity that makes you save on time and costs of printing. It has a duty cycle of 7000 pages per month. It has Ethernet connection that lets you share printer with different users within the area. Its wireless connectivity enables printing from anywhere sans the wires and cables. Canon Pixma MX426 comes with a 2.5” LCD that gives a clear display of printer menu. It lets you operate functions of photo printing, copying, scanning and faxing, with ease. It measures 18.03” W x 16.34” D x 7.8” H and weighs 19.4 lbs. It prints with a speed of 8.7 images per minute in mono and 5 images per minute for color. It prints 4” x 6” borderless photos in 42 seconds. Its integrated ChromaLife 100+ technology gives photos that last more than a lifetime while its hybrid ink system blends pigment ink and color dye inks to give clear black text even as it prints over an image. It allows direct printing from sources such as memory cards, flash drives, Pictbridge enabled digital cameras, iPod, iPad, iPhone and Android devices. It scans with a resolution of 1200 x 2400 dpi and allows scanning, straight, to flash drives. An auto scan mode automates scanning. Its new reserve copy feature lets you scan on a following document while waiting for your document or photo to be copied. It copies with a speed of 3.4 images per minute for color. It copies with precision, owing this to its Dual Colour Gamut Processing Technology. It delivers high speed transmission of faxed documents or photos. Its auto document feeder can hold up to 30 sheets. It is capable of storing 250 faxes in memory. It supports different media forms such as plain paper, photo paper, matte paper, glossy paper, photo stickers, t-shirt transfers and envelopes. It can hold different sizes of A4, A5, B5, letter size and legal size. It has wireless connectivity that lets you print from any location without the clutter brought about by wires and cables. It has Ethernet connection that allows printer sharing among multiple users within the network. Canon Pixma MX416 measures 18.03” W x 16.34” D x 7.08” H and weighs 18.96 lbs. It prints at 8.7 images per minute for mono and 5 images per minute for color, with a resolution of 4800 x 1200 dpi. It prints 4” x 6” borderless photos in 42 seconds and can print borderless photos up to a maximum of A4 size. It comes with the ChromaLife 100+ technology that produces prints that last for hundreds of years while sharp text is given by its hybrid ink system the combine pigment and color dye inks. It allows direct printing from sources such as memory cards, high flash drives, Pictbridge enabled cameras, iPod, iPhone, iPad and Android devices. It scans with a resolution of 1200 x 2400 dpi and comes with an auto scan mode that automates scanning and saving. Its new reserve copy feature allows you to scan in the next document while waiting for a copy job. It enables accurate reproduction of second generation documents and photos. It has high speed fax transmission and has a resolution of 300 x 300 dpi for mono and 200 x 200 dpi for color. It can store up to 50 faxes in memory. Its security features include re-entry of fax number, checking of RX fax info, rejection of caller and rejection of fax received. It has wireless connectivity that gives you the convenience of using your printer any room of your house or office. Its Ethernet connection let you share your printer with other users within the network. It supports different forms of media such as plain paper, photo paper, matte paper, glossy paper, photo stickers, t-shirt transfers and envelopes. It can hold different media sizes of A4, A5, B5, letter size and legal size. Canon Pixma MX886, MX426 and MX461 are the new Pixma all-in-one printers that offer smart solutions to home users and home offices. They come with enhanced speeds and enhanced functions that let you print, copy, scan and fax with ease while giving exceptional prints and photos that are designed to last. This is made possible with the technologies incorporated into these printers. Their flexible media handling allows you to maximize productivity. An auto document feeder lets you leave printer functions unattended to do other tasks. Large trays are capable of supporting different media forms and sizes. These printers are versatile in their capabilities to print directly from sources, without the need of a PC. Furthermore, wireless connectivity lets you print from any room without any hanging wires or cables that can add to the clutter of a workplace. Ethernet connection simplifies maintenance of printer and saves on costs since you can share it with other users in your home or office. With all these smart features and with the help of this Canon Pixma Smart Office Multifunctional Printers review, these devices will surely find their way into many homes and offices.